Buy Granovita Gourmet Pate - Olive 125g in the UK from our online shop or directly from our independent Scottish store. A delicious gourmet vegetarian organic tofu pate made with olives, peppers, herbs and spices. Where can you buy real Granovita Olive Pate safely online? 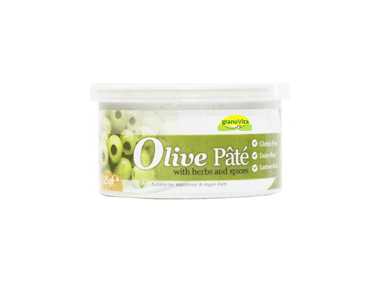 If you are wondering where you can buy Granovita Gourmet Pate - Olive 125g safely online in the UK, then shop with us. Granovita Olive Pate - Granovita Gourmet Pate - Olive 125g in Vegetarian Pate and Honeys, Jams & Spreads.